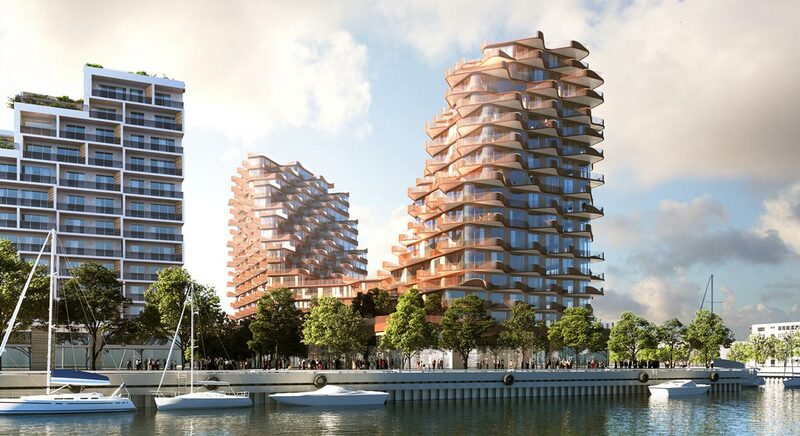 Toronto’s East Waterfront has a new pre construction condominium that looks like a series of waves and you can now register to Get Platinum VIP access to floor plans and price list. 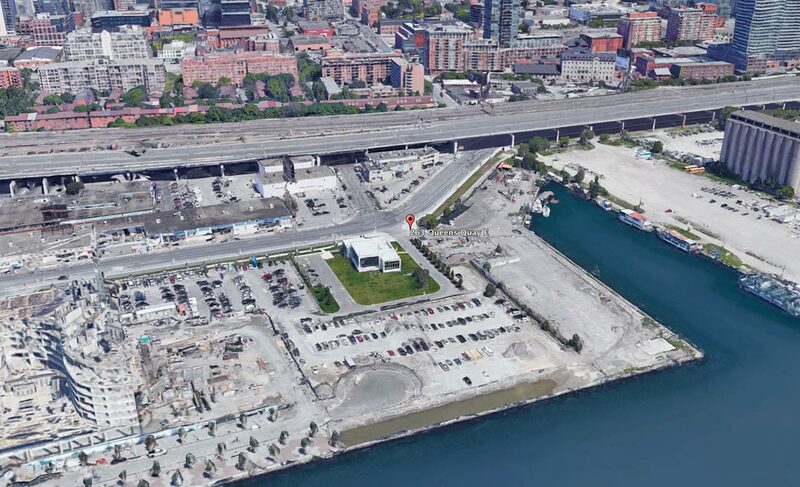 Aqualuna at Bayside downtown Toronto is the final phase and last opportunity to own a Tridel brand condominium in Toronto’s Bayside neighbourhood, south of Queens Quay and between Sherbourne Common and the Parliament Street Slip. Suite sizes will range from 500 – 2600 sq ft with retail on the ground level and community-wide WIFI-Service which means that home and business internet is wired to state-of-the-art fibre optic technology. This building will be part of the master planned community which includes sold out developments including Aqualina, Aquavista, and Aquabella. 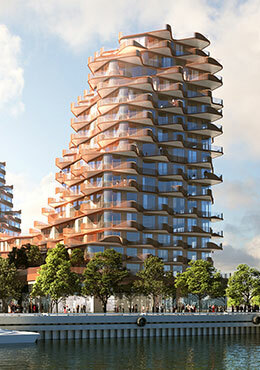 The building with heights of 16 and 19 storeys and a total of 227 units is designed by Denmark’s 3XN architects for Tridel and Hines. It’s designed with two peaks split apart with exterior 45° angled balconies and terraces so that all suites have lake views. 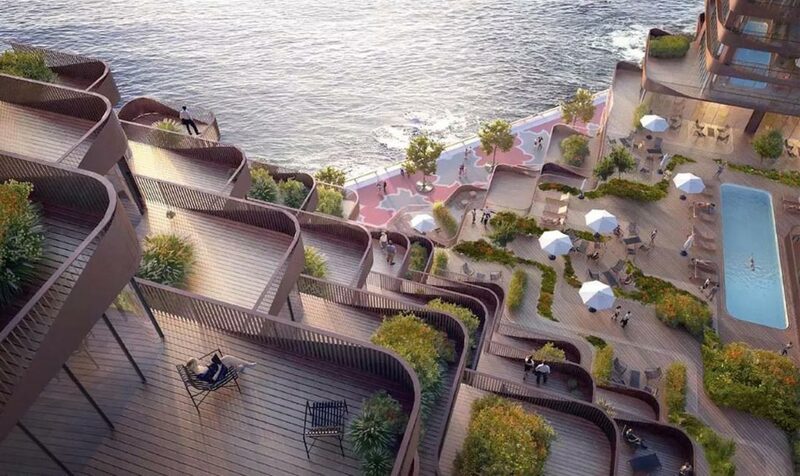 The terrace of in between the two peaks is a space for the building’s shared amenities on the fifth floor of the building. 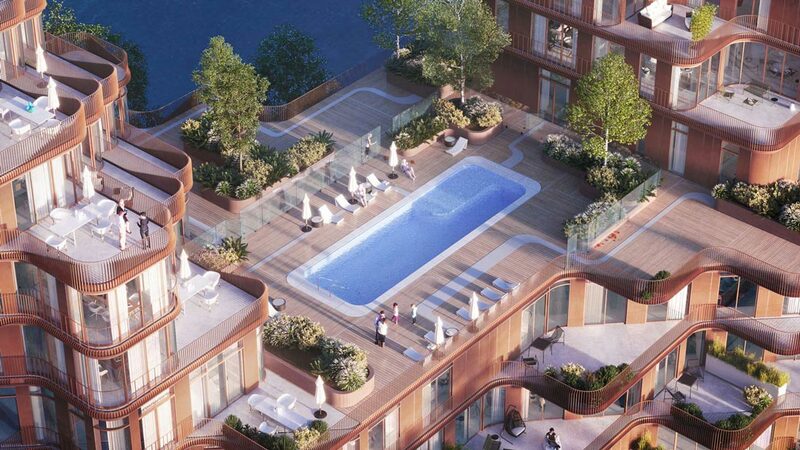 Aqualuna’s sweeping balconies and terraces feature magnificent views of the glimmering lake and city of Toronto’s skyline. The features and amenities for this luxurious residential development are captivating and breathtaking with modern amenities on 2 floors and spacious suites for residents to enjoy. Aqualuna at Bayside downtown Toronto condos has a Walk Score of 91/100, and an amazing Transit Score with 95/100. TTC Buses, Underground Subway Stations and Streetcars are all located nearby and the Gardiner Expressway and DVP is also minutes away. 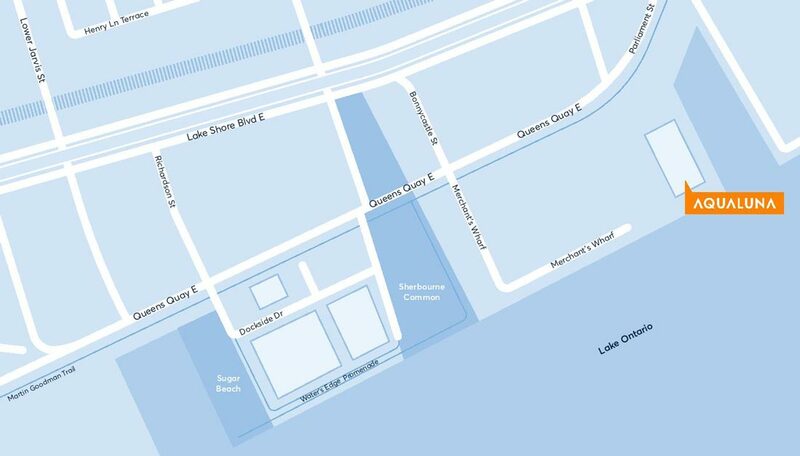 George Brown College students will enjoy short walks to both the Waterfront and King street campuses and the Ryerson U is under a 20 minutes TTC ride. 263 Queens Quay E, Toronto, ON M5A 1B6 is located minutes to what’s known as East Harbour and is set upon some 60 acres of land, including a Yorkdale-sized shopping complex, a transit hub that would integrate GO Transit train lines, a streetcar route, a possible relief subway line and 11 million square foot of office space. 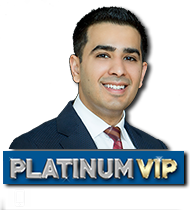 Register below and Get The Best Units At The Best Pricing! 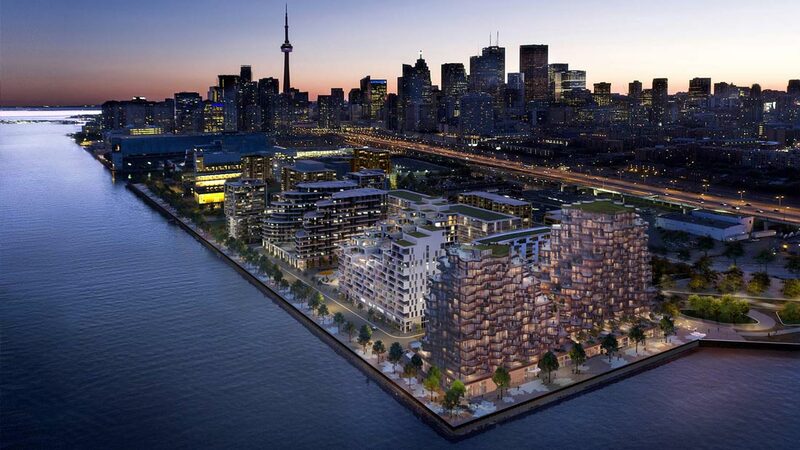 Live Along The Shores of Toronto’s Harbour. Be among the first set of purchasers to choose floor plans, receive bonus VIP incentives and discounted Platinum pricing.